Do you remember a few months ago when I posted that a recipe I created won a contest and the prize was a trip to San Francisco? 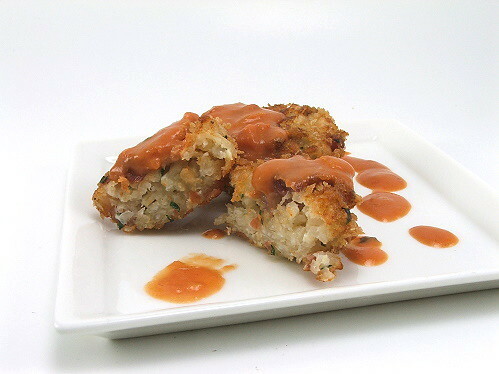 At the time I was not able to share the recipe due to the ‘super-secret’ nature of the contest. Well, the contest is over and I am free to share, and share I shall. 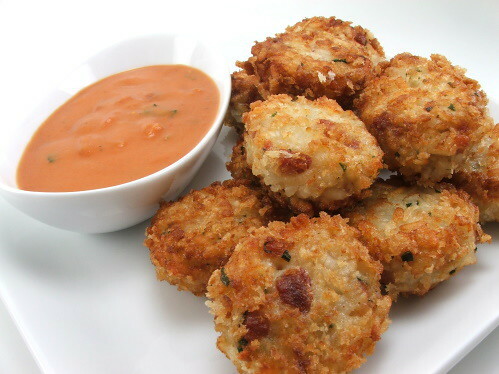 These are my Pancetta Risotto Cakes and they are among my favorite appetizers to prepare, and consume. They are hearty enough to be a main meal (or so the folks at Bertolli told me) but I prefer them piled on a platter as finger food! I mean, who doesn’t love deep fried carbs? Anyone?? 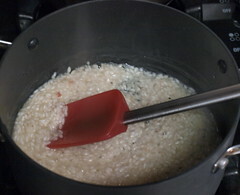 They are really easy to make, and you can make them as far as two days ahead to the point of chilling the risotto. 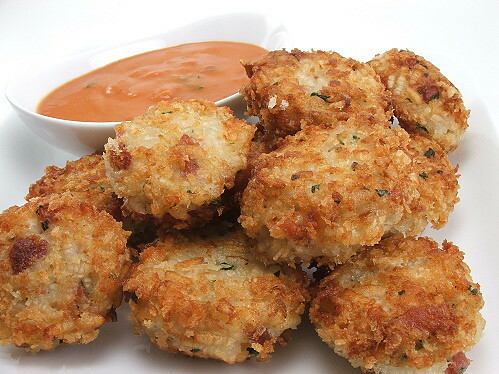 They fry up in no time and are crunchy on the outside while remaining creamy on the inside. They are, in short, perfect! 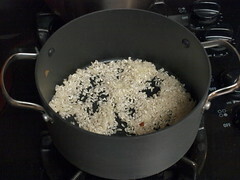 In a medium pot, with a lid, heat the chicken stock over medium heat until it comes to a simmer. Reduce the heat to low and cover. 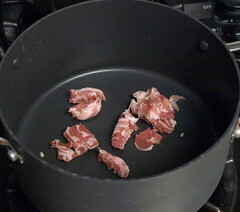 In a medium sized skillet over medium heat cook the pancetta until the fat is rendered and the pancetta is crisp, about five minutes. 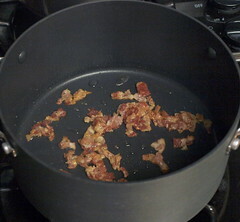 Remove the pancetta from the pan and set aside. Reserve the fat. 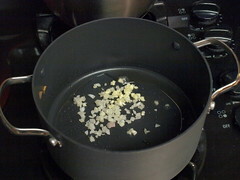 Add the shallot and garlic to the pan and sauté until fragrant, about thirty to forty-five seconds. 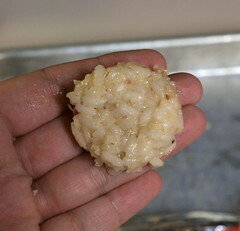 Add the rice and stir until the rice is coated in the fat, about one minute. Add the wine and stir until absorbed. Begin adding the warm broth, ½ cup at a time. 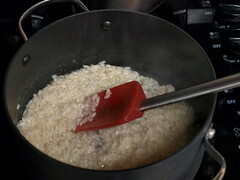 Stir after each addition and add more broth as the rice absorbs the previous addition, about twenty minutes. 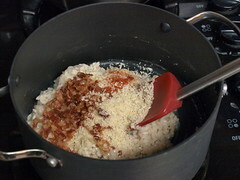 Turn off the heat and allow to cool slightly before you add the cooked pancetta, parsley, cheese, red pepper, salt and pepper, ¼ cup of the panko and one egg white. 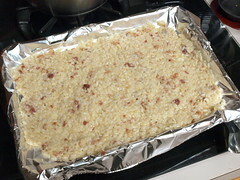 Mix well then spread the risotto onto a large sheet pan to cool completely. 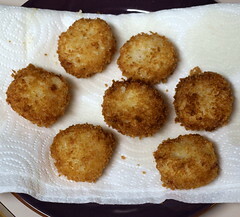 Prepare two shallow dishes, one with the remaining panko and the other with the remaining egg whites mixed with the water. 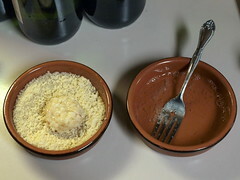 Using a disher, or a tablespoon, scoop the risotto mixture into 1” balls. 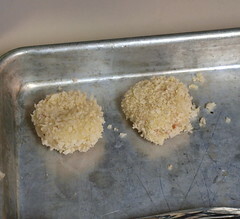 Flatten gently with your palm, but don’t press them too thin, then dip first in the egg whites and then into the panko. 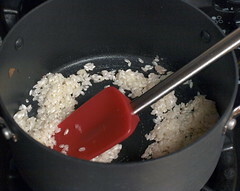 In a heavy skillet heat ½” of oil over medium high heat until it shimmers. 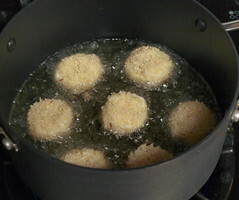 Carefully add the risotto cakes, leaving 1” of space between them as they cook. You will have to cook them in batches. 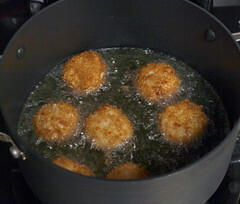 Cook for 1 to 2 minutes per side, or until golden brown. Once cooked, drain the cakes on paper towels. You can keep them in a warm (250F) oven if you need to hold them. While the cakes drain heat the vodka sauce and basil in small saucepan over medium heat until it simmers. 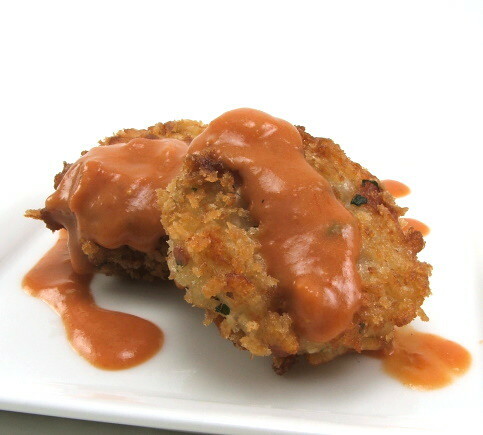 Serve the cakes with the sauce.